In the Products of Design program, an opportunity to investigate the direct relationship between design and politics occurs biennially with the U.S. elections. This year, it was all about the Midterm Elections—when politicians compete for seats in the U.S. Legislative branch (Congress), as well as in State and Local political races. The opportunity space for the 3-day workshop was Messaging. 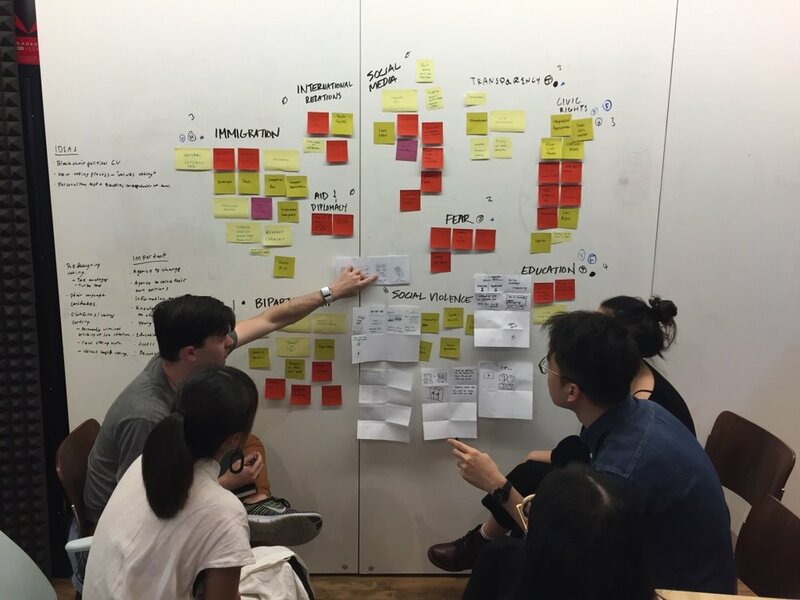 In a tense political climate, mixed groups of first- and second-year PoD teams investigated how design can mitigate the negative impacts of political messaging, and develop design strategies that fully enfranchise citizens in the democratic process. We then took our work out into the streets of New York City. Given that 17% of New York City residents are not citizens, centering political conversations solely around voting is inherently exclusionary. Team “Voice” sought to reflect and empower non-citizen immigrants who voice their political opinions despite not being able to formally participate with a vote. Mirroring the NYC Votes branding, “I Voice” creates inclusion by offering wearable stickers that affirm, “I Voiced” in one of six languages: Traditional Chinese, Simplified Chinese, Korean, Hindi, Spanish, and English. Traveling through the Lower East Side, Team “Voice” met with fourteen people from seven different countries: China, Mexico, Puerto Rico, Korea, USA, India, and Iran. The two-day design intervention revealed widespread concern about anti-immigration policies and sentiments in the United States among voting and non-voting immigrants. Non-voters reported finding solace in their ability to organize around these issues within their communities; and many actively encourage friends and family who can vote to participate in the process and influence change. Participants in the design provocation who “Voiced” but did not vote, received a sticker as a way to honor their actions; which many said made them feel included and empowered in a system that otherwise excludes them politically. The artifact is the message, indicating that despite being dis-enfranchised from the political system they are still engaged in the collective endeavor of our democracy. The object serves as a form of recognition for the citizen while also reminding citizens around them, including politicians and the politically-minded, that non-citizen immigrants participate in the U.S. political system, even without the right to vote. To Voice is to be heard; to wear the “I Voiced” sticker is to be seen. This artifact, more broadly adopted, offers an opportunity for non-voters to be more visible in a way that initiates positive policy changes.